MLA Verlyn Olson joined the anti-bullying campaign. Mayor Bill Elliot joined the campaign and hundreds of others donned symbolic pink shirts on February 27th to express their support for the anti-bullying campaign. The support for the campaign has grown dramatically. During the 2012 campaign 778 T-shirts were sold. Another 565 pink T-shirts were sold this year, along with just over 900 pink wrist bands. Debbie Pearson, Wetaskiwin Boys and Girls Club and a major player in the campaign sums it up. 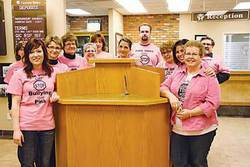 "It has been amazing to see more agencies, businesses and schools take part in Pink Shirt Day. But the Committee feels that everyone must remember what the day is about, not just wearing a pink t-shirt. This is an anti-bullying campaign and our community members, young and old, should treat everyone they come in contact with, at home, work or school, with respect and to be careful what you say and do, not just one day of the year but every day." Businesses and organizations throughout the entire community and region participated. Connie York, Manager, Deposit Services, Wetaskiwin Credit Union explains why their staff were behind the campaign. “The (Credit Union) Board of Directors and staff can be found volunteering at many events in our community. They provide support to the Boys & Girls Club, Friends of the Community, WDACS, Wetaskiwin Regional Aquatic & Fitness Centre, Wetaskiwin Health Foundation, Wetaskiwin & District Heritage Museum – just to name a few.” On February 27, 2013 their community support was evident by all the staff wearing pink in support of the “Bulling Stops Here” campaign. The Wetaskiwin Credit Union will be celebrating 75 years of service to the community next year. This is quite an accomplishment from the first year when their profit was $28 to nearly 100 million in assets in 2012. They are proud to have allocated over 10 million dollars in profit share patronage.